If you no longer wish to use Edublogs or CampusPress, simply leave your username account inactive. There are no security risks associated with this policy and your information isn’t visible anywhere on Edublogs or CampusPress. Your display name is what is displayed on any comments or posts you publish. The easiest option for changing your username is to change your display name. For example, my username is suewaters and my display name is Sue Waters. When I log into my account I log in as suewaters and the name Sue Waters is displayed on any posts or comment I publish. 2. Scroll to near the bottom of the page to the Name area. 3. Add your first name and last name. 4. 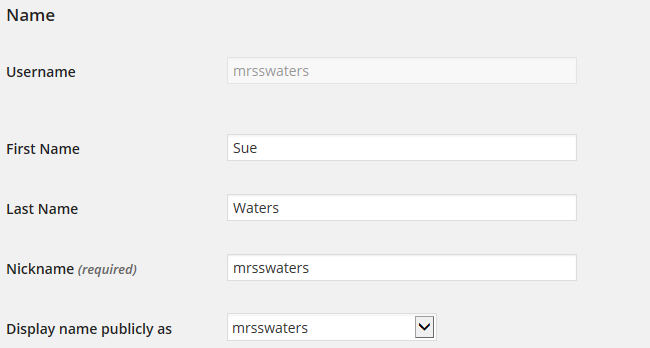 Click on the drop down arrow to select your preferred publicly displayed name. 6. Now every post or comment you write will display that name. To change your username you need to create a new username using Users > Add New. You can’t create the new username using the same email address because as your existing username because each user account requires a unique email address. This is required for purposes such as password resets. 1. Log into your current account. 3. Scroll to near the bottom of the page to the Contact Info area. 4. Type your new email address. 6. An email will be sent to the new address asking you to click on the link to confirm the change of email address. Your email address won’t be updated until you click on this link in the email. You must be logged into your Edublogs or CampusPress account in the same web browser that you use to open the link in. 7. Once the new address has been verified you will now be able to create a new username or new blogs using the original email address. You may need to wait 48 hours after changing the email address before you can create the new username. Contact Edublogs Support if you need help changing your email address. Spam filters, especially strict ones for institutional email addresses, block the emails from your blog. If you don’t receive this email you may need to use an alternative address. 2. Add your new username. 4. Select the user role Administrator. 6. Your new user is automatically added to Users > All Users and you will receive an email with your new login details.